﻿The only defensive structure recorded archaeologically is the tower of Capçades, situated on the slopes of one of the small hills which bound the southern area of the Plá, some distance from the most fertile lands. The tower consists of a solid foundation of 5.60 x 3.85 metres and a maximum preserved height of around 1.70m constructed with lime mortar and pebbles, finished on the exterior with a coat of lime mortar. Originally it was least two stories high with a flat terrace giving a view of the valley and a good part of the bay, and serving as a refuge for nearby inhabitants. The west side of the tower supports a building of which only two walls remain, with a threshold and a bread oven built against the outer wall. This construction is typical of the few remains of farmsteads built around towers. ​Archaeological finds indicate that it was inhabited from the end of the 11th century until a little after the Christian conquest. In Islamic times the Xàbia valley was characterised by many small settlements (we know of more than 20) which formed part of various farmsteads into which the area was organised . The majority were situated at the foot of the mountain, near agricultural lands. However, some were on rugged areas, such as the Plana Justa and the Montgó, where farming would be oriented towards grazing animals. There were also settlements on the coast dedicated to fishing and trade, such as those documented on the island of Portixol or la Fontana point. 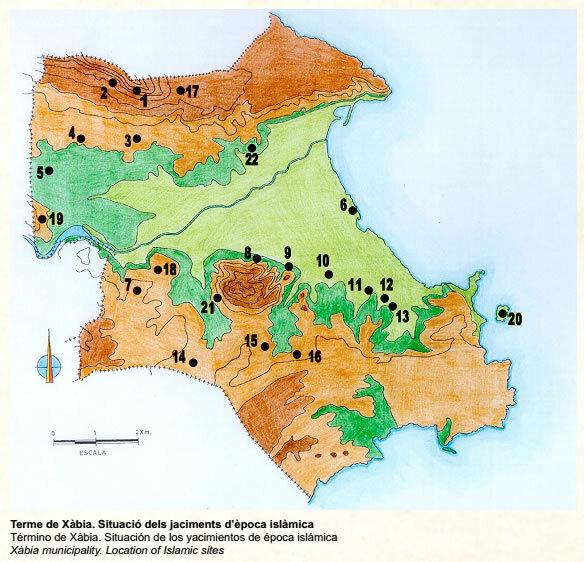 The defining elements of these settlements is the amount of ceramics on the surface, and the silos or ‘pou de moros’, as they are popularly known. These structures were excavated in the white marl subsoil. They have a circular mouth about 0.50 metres wide, are bell-shaped or globular in profile and 1.5 to 2 metres deep. The pits were used to store cereal crops, keeping them away from damp, rodents and insects. They were used as food stores for the community, as well as supplies to sell and earn money to pay taxes. There is no documented evidence about the political and social organisation of Xàbia in Islamic times. It is thought that the castle upon which the farmsteads depended was that of Denia, whose distance away meant that larger settlements erected watch towers as refuges in case of danger. Thanks to Christian records, we know of the existence of other towers. 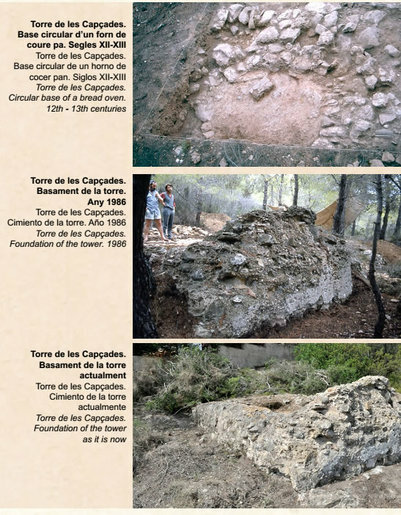 There are several references to the Torre de en Cayrat in the courtyard of the former Augustinian convent, now the covered market, on the top of the hill where Xàbia old town is located. 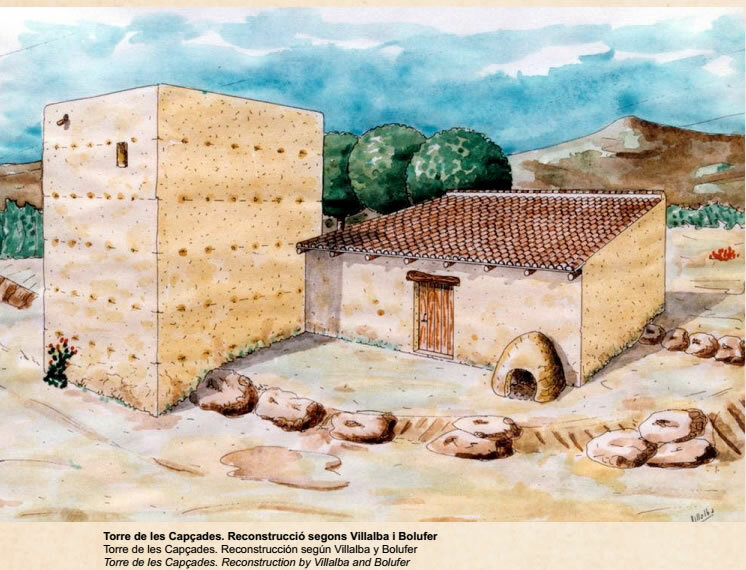 This building possibly served as a refuge for the inhabitants of a farmstead of which we know nothing except two silos and some Islamic ceramic materials found in urban excavations. Records from Christian times also mention other farmsteads, almost certainly of Islamic origin, which in one case continued to be used during the early period of the Christian feudal conquest. The tower and farmstead of Benimadroc were ceded to Galcerà of Cruanyes by King Jaume I in July 1264. This is located in the area of the same name at the rock shelter of the Montgó and Islamic ceramics have been found on the surface there. We also know of the existence of the farmsteads of Cansalada, Terradola and the Font d’Andó. Without doubt, one of the most important sites has to be the farmstead of Lluca, given by the king to Alvar de Sapena in 1256. 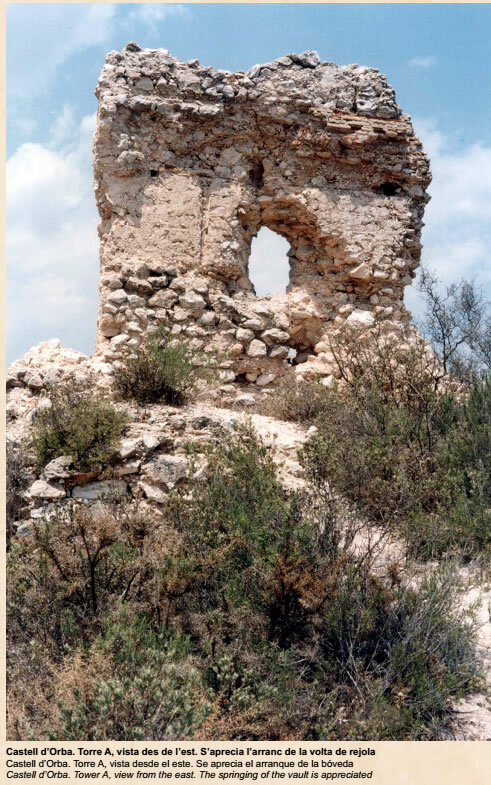 The remains of a tower popularly known as el Carcel (the prison) were conserved there until the 1960's. The settlement was located next to the road to Benitatxell on a hillside facing east. Archaeology confirms the remains of a 12th century Islamic rubbish dump, and structures and materials from later Christian occupation in the 14th and 15th centuries.